Description: This is an Original Little People Mail truck set. 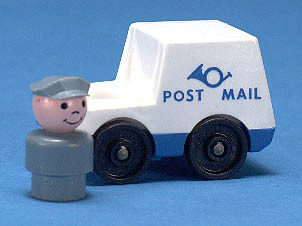 The set includes a small mail truck and a mailman figure. 1978 Fisher-Price Catalogue: - This set was first introduced in 1978, but was marked #123. It didn't receive it's individual part number until 1979. A boxed Mail Truck set marked #123 is very rare. FPT447 - Mail truck with a white body, blue base, and closed roof. Has a Bugle and "POST MAIL" in RED on the both sides. Wheels are marked "FISHER-PRICE TOYS". BHWP - Short gray body mailman with a gray hat. FPT443 - Mail truck with a white body, blue base, and closed roof. Has a Bugle and "POST MAIL" in BLUE on the both sides. Wheels are marked "FISHER-PRICE TOYS". BHPP - Short gray body mailman with a gray hat. FPT448 - Mail truck with a white body, blue base, and closed roof. Has a Bugle and "POST MAIL" in RED on the both sides. Wheels are NOT marked. The #127 Mail truck is the only mail truck sold with "POST MAIL" and a Bugle design on the side. The design was available in red and in blue. 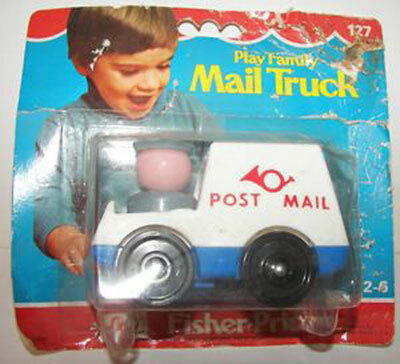 Originally, the mail truck wheels were marked "FISHER-PRICE TOYS", but these stamped wheels were replaced with non-marked wheels sometime during the 1980's. FPT444 - Mail truck with a white body, blue base, and closed roof. Has a Bugle and "POST MAIL" in BLUE on the both sides. Wheels are NOT marked. FP127SET1978 - (Complete set in blister pack) - This set was first introduced in 1978, but was marked #123. It didn't receive it's individual part number until 1979. A mint set marked #123 is very rare and more valuable than a mint set marked #127. FP127SET1979 - (Complete set in blister pack) - This set was sold in a 5-1/2" high x 6" wide blister pack, and was also available in #123 Play Family Vehicle Assortment.